Instrumental Color Ear Training Series expands the “Context” of your one note ear training skills. The “One Note Ear Training Method” is initial taught with a piano or voice sound. Many students have difficulty transferring the ear training skills they obtain with the piano to other instrument timbres. The Instrumental Color Ear Training Series helps solve this problem by giving you the “Ear Training One Note” exercise with various instruments. Instrumental Color Ear Training Series contains no books so we recommend that you use these exercises in conjunction with the “Ear Training One Note Complete” if you need directions on how to properly develop your ear training skills. Each instrument has six different levels rather than the traditional 3 levels found in other One Note Ear Training Methods. This gives a student more of a graduated learning curve and removes the need to buy the One Note Extreme Method to complete their study. If also adds exercises that use both a minor key center and answers with both degrees and note names. This makes the Instrumental Color courses a cost effective way to study all aspects of the one note method and prepare for Key Note Recognition the next step in the ear training process. It allows you to focus on a particular timbre that may be causing you problems. It allows you to focus on a particular range of pitches that may be causing you problems. It allows you to focus on the instrument that you play. It allows you to focus on instruments that you commonly play with in band situations. It allows you to adjust to the common characteristics of instruments such as vibrato, bends, attack or decay. Here is a breakdown: Click on a title to go directly to the book. Instrumental Color Ear Training Bundle is the most cost effective way to study! A Major Cadence followed by a note then the answer given as a note name. A Minor Cadence followed by a note then the answer given as a note name. A Major Cadence followed by a note then the answer given as a degree name. A Minor Cadence followed by a note then the answer given as a degree name. Improve you ability to hear One Note Ear Training on these five Instruments! Click on individual instrument if you prefer a single download. The Bundle is great because it allows you the mix up the type of instruments you listen to as well as the 6 different speed levels making practicing ear training much more dynamic and fun! Below are six different levels for Acoustic Steel String Muted Guitar with a Minor Cadence and a note name answer. The Bundle is great because you can work on specific ranges of notes that may cause you problems. Below are six different levels for Mandolin with a Major Cadence and a degree answer. The Bundle is great because it allows you work on hearing the instruments that you commonly play with in band situations. Below are six different levels for Banjo with a Minor Cadence and a degree answer. The Bundle is great because it allows you to work on unusual sounding instruments which strengthens your overall ear training skills. Below are six different levels for Ukulele with a Major Cadence and a note name answer. The Bundle is great because it allows you keep your ear training exercises fresh because you are always switching instruments to make it more interesting. Always keep “context” in mind. As always, keep in mind that context is the secret behind all great ear training skills. The more you vary the type of exercise you do, the more you will be able to apply this ear training to the multitude of situations that will come your way in your musical life. The bundle is a great way to save money. If you buy all five Instrumental Color Instruments separately it will cost you $74.95. Get them now for one low low price of $39.99. Get Instrumental Color: One Note Ear Training Plucked String V1 Bundle download today! Includes MP3s for five instruments: Click on individual instrument if you prefer a single download. Below are six different levels for Acoustic Steel 12 String Guitar with a Minor Cadence and a note name answer. Below are six different levels for Acoustic Steel 12 String Muted Guitar Major Cadence and a degree answer. Below are six different levels for Lap Slide Guitar (No Bends) with a Minor Cadence and a degree answer. The Bundle is great because it allows you to work on unusual sounding instruments which strengths your overall ear training skills. Below are six different levels for Acoustic Bass with a Major Cadence and a note name answer. Get Instrumental Color: One Note Ear Training Plucked String V2 Bundle download today! Below are six different levels for Tenor Sax with a Minor Cadence and a note name answer. Below are six different levels for Baritone Sax with a Major Cadence and a degree answer. Below are six different levels for Flute with a Minor Cadence and a degree answer. Below are six different levels for Clarinet with a Major Cadence and a note name answer. Get Instrumental Color: One Note Ear Training Woodwinds V1 Bundle download today! The Bundle is great because it allows you to work with instruments that you may listen to or compose for, thereby making your recognitions skills better for these instruments. Below are six different levels for English Horn with a Major Cadence and a degree answer. The Bundle is great because you can work on instruments they may create problems because they are seldom used..
Below are six different levels for French Oboe with a Minor Cadence and a note name answer. The Bundle is great because it allows you work on instruments with various ranges. Below are six different levels for Oboe with a Minor Cadence and a degree answer. The Bundle is great because it allows you to work on instruments in a minor key which can initially confuse the ear. Below are six different levels for Piccolo with a Major Cadence and a note name answer. The Bundle is great because it allows you work at 6 different speeds thereby helping you to hone in the exact speed that pushes you to a higher level. Get Instrumental Color: One Note Ear Training Woodwinds V2 Bundle download today! Below are six different levels for Harpsichord with a Minor Cadence and a note name answer. Below are six different levels for Jazz Organ with a Major Cadence and a degree answer. Below are six different levels for Rhoads with a Minor Cadence and a degree answer. Below are six different levels for Wulitzer with a Major Cadence and a note name answer. Get Instrumental Color: One Note Ear Training Keyboard Bundle download today! Each single instrument download will have a varying number of MP3s depending upon the range of the instrument. Please keep in mind that these downloads do not contain instruction for the ear training method. You would need on of the Ear Training One Note Series books for that information. Click on individual instrument purchase information and to hear examples. Instrumental Color One Note Ear Training for Acoustic Steel String Guitar expands the “Context” of your one note ear training skills. The “One Note Ear Training Method” is initial taught with a piano or voice sound. Many students have difficulty transferring the ear training skills they obtain with the piano to other instrument timbres. The Instrumental Color Ear Training Series helps solve this problem by giving you the “Ear Training One Note” exercise with various instruments. This course contains no books so we recommend that you use these exercises in conjunction with the “Ear Training One Note Complete” if you need directions on how to properly develop your ear training skills. Each Instrument has 6 different speed levels making practicing ear training much more dynamic and fun! Get Instrumental Color Series Ear Training for Acoustic Steel String Guitar download today! Instrumental Color One Note Ear Training for Muted Acoustic Guitar expands the “Context” of your one note ear training skills. The “One Note Ear Training Method” is initial taught with a piano or voice sound. Many students have difficulty transferring the ear training skills they obtain with the piano to other instrument timbres. The Instrumental Color Ear Training Series helps solve this problem by giving you the “Ear Training One Note” exercise with various instruments. Below are six different levels for Muted Acoustic Guitar with a Minor Cadence and a note name answer. Different instrumental allow you to concentrate on a specific ranges of pitches that may cause you problems. Get Instrumental Color Series Ear Training for Muted Acoustic Guitar download today! Instrumental Color One Note Ear Training for Mandolin expands the “Context” of your one note ear training skills. The “One Note Ear Training Method” is initial taught with a piano or voice sound. Many students have difficulty transferring the ear training skills they obtain with the piano to other instrument timbres. The Instrumental Color Ear Training Series helps solve this problem by giving you the “Ear Training One Note” exercise with various instruments. Doing the One Note Ear Training with the instruments that you commonly play with in band situations helps you hear them better. Get Instrumental Color Series Ear Training for Mandolin download today! Instrumental Color One Note Ear Training for Banjo expands the “Context” of your one note ear training skills. The “One Note Ear Training Method” is initial taught with a piano or voice sound. Many students have difficulty transferring the ear training skills they obtain with the piano to other instrument timbres. The Instrumental Color Ear Training Series helps solve this problem by giving you the “Ear Training One Note” exercise with various instruments. These instruments are great because they allow you to work on unusual sounding instruments which strengthens your overall ear training skills. Get Instrumental Color Series Ear Training for Banjo download today! Instrumental Color One Note Ear Training for Ukulele expands the “Context” of your one note ear training skills. The “One Note Ear Training Method” is initial taught with a piano or voice sound. Many students have difficulty transferring the ear training skills they obtain with the piano to other instrument timbres. The Instrumental Color Ear Training Series helps solve this problem by giving you the “Ear Training One Note” exercise with various instruments. These different instruments are great because it allows you keep your ear training exercises fresh because you are always switching instruments to make it more interesting. 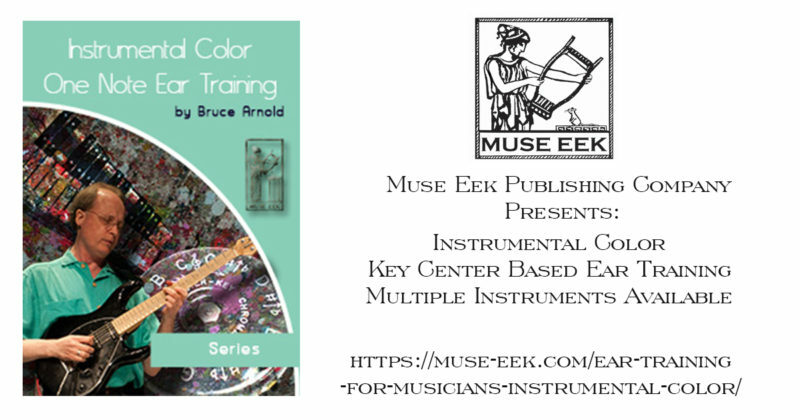 Get Instrumental Color Series Ear Training for Ukulele download today! Instrumental Color One Note Ear Training for Acoustic Nylon String Guitar expands the “Context” of your one note ear training skills. The “One Note Ear Training Method” is initial taught with a piano or voice sound. Many students have difficulty transferring the ear training skills they obtain with the piano to other instrument timbres. The Instrumental Color Ear Training Series helps solve this problem by giving you the “Ear Training One Note” exercise with various instruments. Working on one note ear training with different instrument gives you refreshing new sounds to hear each day! Get Instrumental Color Series Ear Training for Nylon String Guitar download today! Instrumental Color One Note Ear Training for Acoustic 12 String Guitar expands the “Context” of your one note ear training skills. The “One Note Ear Training Method” is initial taught with a piano or voice sound. Many students have difficulty transferring the ear training skills they obtain with the piano to other instrument timbres. The Instrumental Color Ear Training Series helps solve this problem by giving you the “Ear Training One Note” exercise with various instruments. Working with instruments that have doubled strings can be challenging so don’t overlook those instruments. Get Instrumental Color Series Ear Training for Acoustic 12 String Guitar download today! Instrumental Color One Note Ear Training for Acoustic 12 String Muted Guitar expands the “Context” of your one note ear training skills. The “One Note Ear Training Method” is initial taught with a piano or voice sound. Many students have difficulty transferring the ear training skills they obtain with the piano to other instrument timbres. The Instrumental Color Ear Training Series helps solve this problem by giving you the “Ear Training One Note” exercise with various instruments. Below are six different levels for Acoustic 12 String Muted Guitar Major Cadence and a degree answer. Guitars can be played in many ways making them challenging to hear. Muted strings is just one example of many ways the guitar can be played. Get Instrumental Color Series Ear Training for Acoustic 12 String Muted Guitar download today! Instrumental Color One Note Ear Training for Acoustic Lap Slide Guitar (No Bends) expands the “Context” of your one note ear training skills. The “One Note Ear Training Method” is initial taught with a piano or voice sound. Many students have difficulty transferring the ear training skills they obtain with the piano to other instrument timbres. The Instrumental Color Ear Training Series helps solve this problem by giving you the “Ear Training One Note” exercise with various instruments. Even the subtle timbre change between instruments of the same type can effect your ability. Get Instrumental Color Series Ear Training for Lap Slide Guitar (No Bends) download today! Instrumental Color One Note Ear Training for Acoustic Bass expands the “Context” of your one note ear training skills. The “One Note Ear Training Method” is initial taught with a piano or voice sound. Many students have difficulty transferring the ear training skills they obtain with the piano to other instrument timbres. The Instrumental Color Ear Training Series helps solve this problem by giving you the “Ear Training One Note” exercise with various instruments. Some instruments are almost always present in a band situation and therefore are important of your one note ear training practice! Get Instrumental Color Series Ear Training for Acoustic Bass download today! Instrumental Color One Note Ear Training for Alto Sax expands the “Context” of your one note ear training skills. The “One Note Ear Training Method” is initial taught with a piano or voice sound. Many students have difficulty transferring the ear training skills they obtain with the piano to other instrument timbres. The Instrumental Color Ear Training Series helps solve this problem by giving you the “Ear Training One Note” exercise with various instruments. These files are an excellent way to speed up your recognition. Remember faster recognition equals a more effortless ability! Get Instrumental Color Series Ear Training for Alto Sax download today! Instrumental Color One Note Ear Training for Tenor Sax expands the “Context” of your one note ear training skills. The “One Note Ear Training Method” is initial taught with a piano or voice sound. Many students have difficulty transferring the ear training skills they obtain with the piano to other instrument timbres. The Instrumental Color Ear Training Series helps solve this problem by giving you the “Ear Training One Note” exercise with various instruments. By working with both Major and Minor Cadences you prepare yourself to different types of key centers that you may encounter in real music. Get Instrumental Color Series Ear Training for Tenor Sax download today! Instrumental Color One Note Ear Training for Bari Sax expands the “Context” of your one note ear training skills. The “One Note Ear Training Method” is initial taught with a piano or voice sound. Many students have difficulty transferring the ear training skills they obtain with the piano to other instrument timbres. The Instrumental Color Ear Training Series helps solve this problem by giving you the “Ear Training One Note” exercise with various instruments. Working with instruments that have a low range can help with lower pitch recognition. Get Instrumental Color Series Ear Training for Bari Sax download today! Instrumental Color One Note Ear Training for Flute expands the “Context” of your one note ear training skills. The “One Note Ear Training Method” is initial taught with a piano or voice sound. Many students have difficulty transferring the ear training skills they obtain with the piano to other instrument timbres. The Instrumental Color Ear Training Series helps solve this problem by giving you the “Ear Training One Note” exercise with various instruments. Learning to recognize notes by either note names or degrees is crucial to great ear training skills! Get Instrumental Color Series Ear Training for Flute download today! Instrumental Color One Note Ear Training for Clarinet expands the “Context” of your one note ear training skills. The “One Note Ear Training Method” is initial taught with a piano or voice sound. Many students have difficulty transferring the ear training skills they obtain with the piano to other instrument timbres. The Instrumental Color Ear Training Series helps solve this problem by giving you the “Ear Training One Note” exercise with various instruments. Learning the timbre of other instruments helps to solidify your ability to recognize the unique sound of all 12 notes in a key center. Get Instrumental Color Series Ear Training for Clarinet download today! Instrumental Color One Note Ear Training for Clavinet expands the “Context” of your one note ear training skills. The “One Note Ear Training Method” is initial taught with a piano or voice sound. Many students have difficulty transferring the ear training skills they obtain with the piano to other instrument timbres. The Instrumental Color Ear Training Series helps solve this problem by giving you the “Ear Training One Note” exercise with various instruments. Get Instrumental Color Series Ear Training for Clavinet download today! Instrumental Color One Note Ear Training for Harpsichord expands the “Context” of your one note ear training skills. The “One Note Ear Training Method” is initial taught with a piano or voice sound. Many students have difficulty transferring the ear training skills they obtain with the piano to other instrument timbres. The Instrumental Color Ear Training Series helps solve this problem by giving you the “Ear Training One Note” exercise with various instruments. Get Instrumental Color Series Ear Training for Harpsichord download today! Instrumental Color One Note Ear Training for Jazz Organ expands the “Context” of your one note ear training skills. The “One Note Ear Training Method” is initial taught with a piano or voice sound. Many students have difficulty transferring the ear training skills they obtain with the piano to other instrument timbres. The Instrumental Color Ear Training Series helps solve this problem by giving you the “Ear Training One Note” exercise with various instruments. Get Instrumental Color Series Ear Training for Jazz Organ download today! Instrumental Color One Note Ear Training for Rhoads expands the “Context” of your one note ear training skills. The “One Note Ear Training Method” is initial taught with a piano or voice sound. Many students have difficulty transferring the ear training skills they obtain with the piano to other instrument timbres. The Instrumental Color Ear Training Series helps solve this problem by giving you the “Ear Training One Note” exercise with various instruments. Get Instrumental Color Series Ear Training for Rhoads download today! Instrumental Color One Note Ear Training for Wulitzer expands the “Context” of your one note ear training skills. The “One Note Ear Training Method” is initial taught with a piano or voice sound. Many students have difficulty transferring the ear training skills they obtain with the piano to other instrument timbres. The Instrumental Color Ear Training Series helps solve this problem by giving you the “Ear Training One Note” exercise with various instruments. Get Instrumental Color Series Ear Training for Wulitzer download today! This entry was posted in Ear Training and tagged oboe ear training, Bassoon ear training, Trumpet ear training, Acoustic Guitar ear training, Mandolin ear training, Ukulele ear training, Tenor Saxophone ear training, Alto Saxophone ear training, Baritone Saxophone ear training, Clarinet ear training, Flute ear training, Acoustic 12 String Guitar Ear Training, Acoustic Bass Ear Training, English Horn Ear Training, French Oboe Ear Training, Piccolo Ear Training, Banjo Ear Training by Bruce Arnold. Bookmark the permalink.